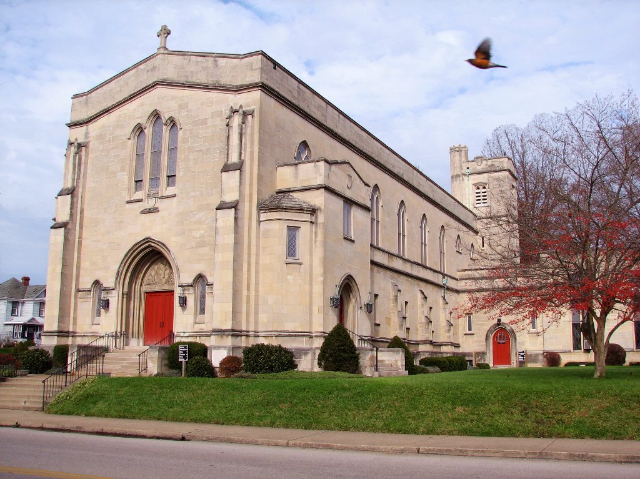 First Lutheran Church has been offering the Mid Ohio Valley family-focused, Bible-based contemporary and traditional services since 1892. We are a member of the Evangelical Lutheran Church of America. All are welcome and we are certain you will find many worship and fellowship opportunities that will appeal to you and everyone in your family. In addition to three Sunday worship services, there are Sunday School classes for Youth, Sr. Youth and Adults, Jr. and Sr. Youth groups meet weekly, Pastor conducts wonderful in-depth Bible studies, there are weekly Faith Filled Women's Bible Studies, Men's Weekly Prayer Breakfast and Confirmation Classes. There is something for all ages and all interests ... and there is always something new on the horizon, too! A Bereavement Group meets twice a month with a lay minister as leader; a Kid's Club summer schedule of Wednesday evening programs has successfully replaced the traditional summer Vacation Bible School - praoviding dinner, Bible studies, crafts and fun for all; Restaurant Rovers are always finding new dining experiences to try; Sr. Singles go out for Monthly Dinners; Golf League brings out the best (and worst) in some of us; we have Summer movies on the lawn; two Community Gardens that provides fresh vegetables for our food pantry as well as free for our neighbors and the community who stop by and help themselves to the fresh veggies provided Mondays, Tuesdays andThursdays - and this year the gardens are providing much-needed fresh veggies for those in West Virginia suffering from devastating floods in June; destination trips and many other seasonal activities add to the fellowship and outreach our members share with one another and the community. The annual German Fest on the lawn under the big tent has become a community favorite, offering lots of home-made traditional German food, a live German band, and many other activities based on our German heritage that make for a wonderful, fun-filled day for everyone. Our community outreach and involvement goes far and wide - including the many families who find assistance from our food pantry and community garden, our prescription drug assistance program, Back-pack Ministry for area schools, Partners in Care to assist military families, Habitat for Humanity, Faithlink, and numerous other agencies working to serve the Mid Ohio Valley. We celebrate all traditional church seasons with worship and praise. We also participate in the many different opportunities for worship our Pastor Reid opens up to us. Compline services during Advent are much-anticipated. The burning of the greens after the Epiphany service in January, followed by cookies and hot chocolate make for special fellowship. Mid-week services during Lent are preceded by a light luncheon before the early service, and light supper before the evening service. During Holy Week, first communicants are honored on Maundy Thursday. Many find the Good Friday services the most moving of the year. Easter Vigil gives us the opportunity to nail our prayers to the cross, and Easter is always a glorious celebration of "He Is Risen"!